Home / Blog (EN) / Will Okapi Checkmate Able To Replace Xbench? As a freelancer, reducing operational cost is very important, including costs to buy the license of CAT and QA tool, cost of certain premium service to support productivity, etc. And recently, I am interested to try Okapi Checkmate (or I will just call it “Checkmate”) as an alternative to Xbench. Checkmate is a free QA tool. It means that I will possibly able to save a 99 EUR per year by stop buying Xbench license. But, is it really possible to replace Xbench with Checkmate? First, if you are interested to try Checkmate yourselves, please download it from here. Choose the package that suits your OS, e.g. Windows 32bit or Windows 64bit. After downloading it, extract the package to your preferred directory. 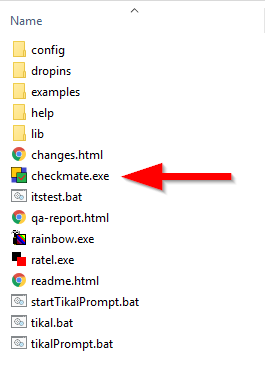 There, you will find several files because Checkmate comes with other tools including Rainbow, Tikal, and Ratel. Double click on the checkmate.exe. 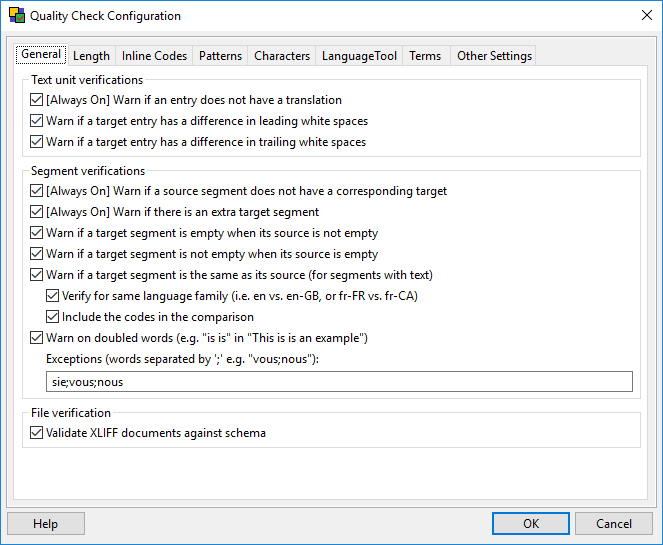 Checkmate can perform various quality checks on bilingual translation files including XLIFF, TMX, TTX, and PO files. To use it, we need to load the files that will need to be checked. Go to File – Add Document menu. Then, the import window will appear. Click on the < … > icon as shown by number 1. Browse and choose your file(s). Then, Checkmate will automatically choose the correct filter configuration based on your files. If not, you can manually choose the filter configuration by clicking on the < … > icon as shown by number 2. Another new window will appear. Choose the filter to match with your file, e.g. SDLXLIFF if you are working with SDLXLIFF files. The next step is choosing your encoding as shown by number 3. Leave it as UTF-8 unless your files or your client need different encoding style. Also, choose your source and target text as shown by number 4 and 5. Once everything is ready, we will return to the main UI. Now, let’s see the quality check configuration by clicking Configuration button or access it through Issues – Edit Configurations menu. There are 8 tabs to be set, and you can set the configuration based on your needs or you can leave it as default. Click OK.
You can also filter the QA result to display the errors found so you can focus fixing segments with similar errors, e.g. segments with missing number or segments with missing translation. And, you can also set the Checkmate so that it re-checks the files everytime you make changes to the files by going to File – Session Settings menu, then give a check mark to the Re-check documents automatically when they change option. After making proper revision based on the errors found, then we can export the QA result into HTML, tab-delimited text, or XML format. You can choose the preferred format from menu Issues – Edit Configurations – Other Settings tab. There you will find Format of the report option. Choose your preferred format and don’t forget to set the path of the report file, e.g. in your target folder. If you choose XML format, then you can import it to Excel to make proper adjustment e.g. giving or add comment column. So now, is it really possible to replace Xbench with Checkmate? I have been using Checkmate for several of my tiny projects recently. The QA options provided by the Checkmate are almost similar to Xbench’s, but I don’t think that it is really possible to use Checkmate as a replacement for Xbench in the near future—that is why still use Xbench. Still there are so many errors left undetected: source/target inconsistency, numeric mismatch, different end punctuation, all uppercase and/or camel words, terminology check still an experimental feature, etc. These lack of features, of course, won’t satisfy the professional translation industry. But I believe that Checkmate still promising and worth to try, and we need to support its development. For example, we can contribute by requesting new features here.